No-Fault Divorce vs At-Fault Divorce in Georgia | Which is Best for You? Divorce in Georgia or any other state can be a weary road of heartache and processes, but at times, it is your best option. When your marriage isn’t working anymore and you are desperate for a way out, you can file for divorce on one of the 13 grounds for divorce in Georgia. The type of divorce you choose, at fault vs. no fault, can determine a few factors such as outcomes, length of time to acquire a divorce, and stress. The Boudreaux Law Firm will help you choose the best type of divorce for your situation and needs. As you can see, the grounds for an at-fault divorce can be a lot of information to take in, which is why it helps to have an experienced divorce attorney to aid you. There are advantages and disadvantages to filing an at-fault divorce, however, that you should be aware of if you are considering this route. At-fault divorce most often affects the division of assets, awarded alimony, and spousal support. The accusing spouse will most likely receive a more favorable outcome for assets and awarded support than the accused spouse. In other words, those who commit adultery, abandonment, or are the cause for the divorce are more likely to get less. The downside of an at-fault divorce is that it could take significantly more time for the grant. The evidence you as the accuser must generate against your spouse can complicate and lengthen the process. At-fault divorces can also cause additional bad-will between you and your spouse. 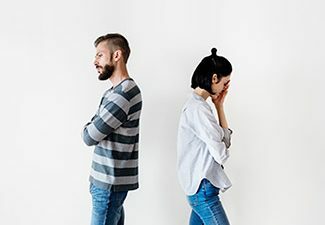 A no-fault divorce occurs when a marriage is “irretrievably broken.” When a spouse is unhappy in their marriage and can no longer continue the relationship, this no-fault ground for divorce allows them to file without having to prove that their spouse did something wrong. No-fault divorce also has advantages and disadvantages to its process. For instance, no-fault divorces are more private for the couple getting a divorce. Since divorce records are made public, a no-fault divorce can keep marital problems confined to just those involved. This type of divorce also tends to be a shorter process. However, a no-fault divorce might not be for you if you want a greater division of assets or a larger sum in alimony or child support. In no-fault divorces, the division of assets and awarded support/custody tends to be more equally divided. Many people believe that both spouses must agree to a no-fault divorce. In Georgia, however, a no-fault divorce can be granted when one or both spouses request one. Depending on your situation and needs, one type of divorce may be more suitable for you than the other. For example, if you want a greater percentage of the assets you may look into an at-fault divorce. If you have no proof of wrongdoing or would like to keep your divorce more private, then a no-fault divorce may be your better option. It is always best to seek advice from a divorce attorney who can thoroughly look at your specific case and tell you what your best option would be. At the Boudreaux Law Firm, we listen to your situation during this trying and emotional time. We help you choose your best divorce option and get you the support you need during and after the divorce. Let us help you through this straining time with our supportive legal guidance. Call to speak to our experienced divorce attorney at 706-869-1334.